We have spent much of the past year (May 13th- October 13th) celebrating the 100th year Anniversary of the apparition of Our Lady to the children of Fatima, Portugal in 1917. One of the things that struck me in studying the story, is the apparent contradiction in tone between the way we talk about faith, especially sin, today and how Our Lady emphasized it then. Currently, we often focus on “meeting people where they are” and helping them move (often very slowly) from sin to repentance and holiness. However, Our Lady was unafraid to show three young children the consequences of sin, by allowing them to experience visions of hell! What then is the message for us? 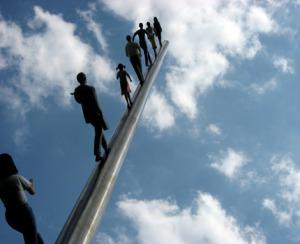 Do we discuss the real possibility of hell or do we like to assume that everyone goes to heaven, regardless of their life choices, faith or lack thereof? Perhaps we should return to an honest discussion of how our choices can lead us away from Christ and the need we have for the sacrament of Confession. Rather than just assume that God’s love covers a multitude of sins ( of course it does as His Mercy is endless), we should think about why we would rather offend the Lord we love, rather than amend our lives to try and please him. For more information on Fatima consider Jean Heimann’s new book, Fatima the Apparition that Changed the World, see review here. Have you ever arrived at the airport determined to carry your own bags to your check -in line without the assistance of a baggage handler? You figured you could avoid that tip and start your vacation on a money saving note. For every passenger “going it alone” there is another asking for help with one carry-on bag trying to avoid breaking a nail or getting sweaty. In between, of course, are the passengers who may have physical limitations preventing them from carrying heavy bags, or the families which divide the task to lessen the load. Let’s face it; carrying heavy bags is no fun and, most people, given a chance, would avoid this task as much as possible. The problem, of course, is that many people do not want to pay the expected tip to the baggage handler. If the service was completely free, many more people would take advantage of the help. Others refuse to acknowledge that they need the help, and can often be seen proclaiming “I got it” as they risk a double hernia and wrap a third bag around their neck. The reality is that we all carry luggage from time to time, whether we like it or not. Like many people, I have unpleasant memories of carrying heavy bags. Whether the load was a schoolbag ready to burst with books and assignments, luggage ready to burst with too many clothes for not enough vacation time, or shopping bags ready to burst with too many purchases with not enough money, I have come to associate luggage and bags with annoying burdens. If dragging a small inheritance around is such a drag, one might wonder why so many of us do it so often. Sometimes, we may have no choice, as when we simply must take many things somewhere. Many times, however, the load is our own doing, and the burden is our own creation. I once read that we could reduce the amount and weight of what we lug around by 80% if we simply planned ahead, seriously examined whether or not we needed some of the stuff we carry, and made a determined effort to be more efficient. One study concluded that at least half of what we drag around is stuff that we always drag around because we are too lazy or distracted to remove it or decide if it is necessary at the present. In other words, more than half of our burdens, our luggage, and the heavy physical, emotional, and intellectual heavy lifting we do come from habit. We develop a script, a menu, a to- do list, a set of daily ingredients, and then we wrap ourselves around that stuff as if it were a flotation device or a life jacket. Regardless of how much luggage we drag around, we can classify said baggage into four distinct categories as described below. Harms………This is the stuff we have done wrong, otherwise known as our sins. Many people accumulate loads of sinful baggage which they refuse to unload out of pride, embarrassment, or fear. I do not know about you, but I feel like a giant weight has been removed when I go to confession. Imagine tons of this garbage piling up in your conscience and life and realize how the task of removal only gets more difficult and less likely with time. Hiccups…..These are the regrets in our lives. We all carry loads of old life stories and issues with us. The class I did not study for, the job I did not take, the person I did not ask out, and the care for my health that I did not take seriously enough are just some examples. Life is like a newspaper. We should read and learn from the news and then throw the old paper away. Living in the past is a terrible prison and weight on our lives. Hopes….These are the things we are dying to do, achieve, or experience. Perhaps you want to retire at a certain age, or maybe you want to earn or save a certain amount of money by a given age in the future. Many call these hopes their bucket list, or things they want to do before they die. It is one thing to aspire, plan, and work toward goals. Likewise, it is commendable to strategize, build, and focus on a given task. However, it is a counterproductive, virtual life prison to wrap your entire life around constantly working toward these hopes 24/7. Hurts….These are the wounds others have inflicted on us. How often do we drag around resentments and bitterness while the person who hurt us is oblivious or could not care less. We think that we are using this anger as a weapon of revenge, but we are only hurting ourselves. Ignoring the culprit feels right as you do it but, in the long run, such things only breed more hurt and harm. The solution to all of this, of course, is to let Christ be your Divine Baggage Handler. Leave all of this stuff in His hands, and have faith that He will take care of your luggage. The only tips you need to give Him are your love, obedience, faith, trust, and devotion. So, the next time you feel the weight of the world on your shoulders, take a load off via Christ and give yourself a break. The other day a friend of mine compared me to Felix Unger, the fastidiously neat character in The Odd Couple, the popular film and 1970s television program based on Neil Simon’s play by the same name. My friend made this observation based on often seeing me organizing my desk, cabinets, closet, and files, as well as often washing my hands with alcohol and soap. Now, before you agree with my friend that I am some sort of weird, neat freak, let me assure you that the reason I organize my stuff so often is precisely because I slip back to messy so easily. Also, I only wash my hands with alcohol and soap when arriving home, having touched money, or having worked in a dirty area. If that makes me weird, then so be it. It is just that I have often gotten colds and infections after not washing my hands, and I tend not to get those things when I do keep my hands sanitized. You may be wondering what dirt and cleanliness have to do with anything in this site, and you would not be alone. After all, isn’t it much more important to save our souls, obey God’s Will and Law, and follow Christ’s example than keeping our hands clean? As Christ Himself reminded us, it is more important to keep our inside clean than our outside (Matthew 23:26). We came from dirt, which is our humanity, and Our Lord loves us so much that He took on the outward dirt of our humanity so that He could remove the inner dirt of our sin on a dirty, dusty cross. Thus, we see that the only dirt that God rejects is the dirt of sin (Luke 10:11) but not the dirt of humanity, which He embraces. Mother Teresa knew a thing or two about dirt; she wrapped herself in it while reaching out to those in most need. Each of us has a mission, a purpose in life which God has designed for us given our particular talents and traits. We cannot serve God without exposing ourselves to both the outer dirt of humanity and the inner dirt of sin, any more than a life guard can hope to save drowning swimmers without getting wet. It is part of the deal, the game, of saving souls. This reality is inherent in what it means to follow Christ. We have to be willing to get our hands dirty if we hope to reach out to those in need. Being a Christian is not about wearing immaculately clean and white uniforms with nice white gloves. It is about selflessly serving others as Our Lord did. Just imagine the absurdity of a man in a spotlessly white uniform and gloves carrying a cross and you will see how inconsistent such an image would be. As I was writing this piece, I received a call from my plumber and a visit from my sprinkler guy. The sprinkler guy has a thriving business with 800 customers, and he was kneeling in the mud changing a sprinkler head. My plumber often looks like he fell in a sewer when he comes to my house. Imagine if you needed a plumber and had to choose between one wearing a perfectly clean, white uniform and gloves as white as snow and one who was full of dirt. I do not know about you, but I would be suspicious of the plumber who looked like an ice cream man. After all, how good a plumber would he be if he never got dirty? The dirty truth about salvation is that salvation is dirty business. We are weak, imperfect, and sinful people far removed from the pristine state of our baptism. We also tend to focus too much on the outward, obvious dirt that we wash off with soap and water and not enough on the inner, less obvious dirt of sin on our souls. Most of us would never dream of going a month without a shower, yet many have no problem going a month without going to confession. In fact, most people worry more about washing their car than their soul. Being a good Christian means we will need freqeunt washing, both on the outside as well as the inside, because saving souls means we often have to take our gloves off. The above quote by St. Irenaeus inspired Johann Georg Melchior Schmidtner to paint the beautiful image of Our Lady, Undoer of Knots which, since 1700, has been venerated in the Church of St. Peter in Perlack, Germany. As we approach yet another Mother’s Day, in which we honor our earthy mothers, it is proper that we realize that motherhood is ultimately about undoing knots. Knots that need to be undone all have something in common; they were all done at one time or another. Good knots are done to hold something in place, to keep something organized, safe, and fulfilling its purpose. The knots on shoes keep the shoes on, just as the knots on clothing keep the clothing on right. We tie knots to keep things together, so that nothing will fall out of place. While good knots fulfill a good purpose, at some point they must be undone. This occurs when it is time to rest, to change, to unpack the things of our lives so as to use them. One cannot reasonably hope to read books, for example, that are held tightly with a knotted rope, without undoing the knot first. That knot was originally made to hold the books together but, at some point, those books cannot fulfill their purpose if they are not released from the knot and opened. We, likewise, are bound to our birth homes, families, and mothers but, at some point, our mothers must undo these bonds to allow us to fulfill our purpose and mission as intended by God. Not all knots are good, of course, and there are many knots in our lives which are done by confusion, frustration, depression, misfortune, violence, addiction, envy, bitterness, hatred and, of course, sin. These knots serve the opposite purpose of good knots. They do not keep things in place, organized, together, or safe. In fact, quite the opposite is true. Bad knots keep things displaced, disorganized, divided, chaotic, and unsafe. Herein we find a key difference between doing and undoing knots. While we seek to tie only good knots in our lives and do everything we can to avoid making bad knots, it is a fact of life that all knots, good or bad, need to be untied at some point. Good ones, as we said above, so that change and rest can occur. Bad ones, as well, but so change, rest, growth, and healing can occur. We cannot grow or heal unless the knots in our lives, good or bad, are loosened. Certainly Our Lord and Our Blessed Mother, as illustrated in this great devotion, can help us undo the knots in our lives, and we are right in asking this of Them within God’s Will. However, as we approach Mother’s Day, let us not forget that God has given us earthly mothers to undo our knots when we are children, as well as teach us how to undo our knots as we grow into adulthood. Yesterday, it was our shoes and sneakers, today it is releasing the knots which prevent us from going out into the world, tomorrow it could be providing guidance or a model of how to handle dilemmas and conflicts with our own children. Ultimately, then, motherhood is about protecting, holding in place, storing, and releasing, which are all accomplished first, by firmly tying knots and, then, perhaps painfully or nostalgically, by undoing the knots of the heart enough to release their children out into the world. Only mothers can understand the heights and valleys of this mission, the tears of joy and sorrow, and the deep bonds which are created and then reluctantly loosened, all out of love. Such is the ironically difficult mission of a mother. She must experience and tighten profound knots holding her children to her while they mature and develop. She then must undergo and loosen those very same knots so as to allow her children to spread their wings and fly. What good is a good teacher, if her students do not go out and apply what she has taught them? What is gained by the sweat of a mover, if the items he ties together to transport safely are never released from their ties and used? Such is the case of a mother’s beautiful and yet difficult task. One final mission of the parents is not only to tie and loosen bonds as needed but, just as importantly, to teach their children which knots should be loosened and which are best left as firmly tied as possible. Sin is all about binding good and releasing bad, and we must all learn to distinguish between what should be released in our lives and what should be kept bottled up. I venture to say that our mothers have, to a greater or lesser degree, been our first teachers in this important life task. Thus, growing and healing toward God is not just about doing and undoing knots, but also about knowing when those knots should be touched at all. Beyond the literal definition of a knot, however, I invite the reader to consider a profound homonym for “knot”, which is “not”. We must consider that many of the “knots” in our lives are actually composed of “nots” in our lives. Sin tells us that we do “not” deserve God, that we “cannot” find mercy, that we will “not” find a way to our eternal destiny with God. One can argue that finding Our Lord through Our Blessed Mother is a wonderful way to overcome the “nots” that keep us from God’s waiting embrace. Bad “nots” are built from not wanting to be told what to do, not being allowed to do as one wishes, not getting what one wants, and so forth. They may also come from not having faith in God, in ourselves, and in our ability to get up from our falls. Sin is about dwelling in “nots” and, therefore, God is about dwelling in “why nots”, as in why not trust God, why not let God in, and why not forgive and love. I once saw a handmade rosary which was composed of a rope with knots, with each knot representing a bead. One might do well to see a rosary as a process of undoing knots and “nots”, on our way to Our Lady and Our Lord, as we pass each bead. Our Lady, Undoer of Knots, should remind us that sometimes, we cannot simply undo some of the knots in our lives, because it is God’s Will that we have them. In such cases, Our Lady is there to remind us that, through prayer and trust in God, we can leap over those life knots we cannot undo, as well as endure those God wants us to bear. So, on this Mother’s Day, let us honor our earthly mothers and, of course, most importantly, Our Heavenly Mother, who do and undo the knots in our lives as needed and possible according to the Will of God. Let us never stop striving to undo the knots of sin in our lives, as well as helping others do the same. The African-American poet and novelist Jean Toomer is quoted as saying that “ we learn the rope of life by untying its knots”. It is safe to say that our first teacher in the art of untying knots may well have been our mother. May God Bless Our Mothers, both those still with us and those who have passed, and may we leave the knots, and the “nots” in our lives to the Hands of Mary, and Our Lord, Who will “not” abandon us ! As many of us know, this year has been declared a Jubilee Holy Year of Mercy by Pope Francis, which should remind all of us that Divine Mercy is a game plan we should follow every day, and not just near Easter. 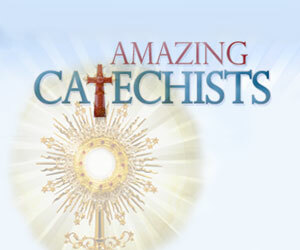 Many otherwise devoted Catholics know little about this beautiful devotion. The message and devotion are based on the writings of Saint Faustina Kowalska, an uneducated Polish nun who, in obedience to her spiritual director, wrote a diary recording the revelations she received about God’s mercy. Its message is both simple and profound, and stands as the perfect antidote to the self-hate that is sin. 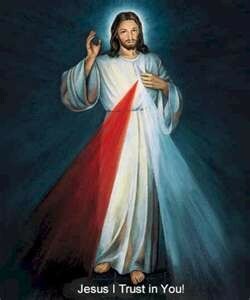 The Divine Mercy Message is simply that God loves all of us more than we hate ourselves. The reason we can make the above statement is that God is all perfect and all love, and His love transcends our weakness and sin. A….Ask for His Mercy through constant prayer, repentance, and petitions for that Mercy. B….Be merciful to others by extending love and forgiveness. C….Completely trust in Jesus in that the more we trust in Him, the more we will receive. We know that the devil is the embodiment of hate, lies, and disobedience. He threw away all that God gave him out of greed for power and independence. Having rejected God with ingratitude and betrayal, the devil wants nothing more than to entice us to do the same. Nothing enrages him more than the fact that we have each been given the ingredients, and the mission, to become saints in the service of God. Consequently, the last thing that Satan wants us to remember is that we can achieve great things in the name and service of God. He wants us to find ourselves incapable, hopelessly lacking in the “impossible” task of ever doing any good. At some level, we know that God’s love and mercy for us is so great that it makes no sense to our simple, human limitation. This love and mercy contradicts satan’s lie that we are worthless and pathetically ill-equipped to make any difference in God’s plan. Since satan does not want us to be in God’s loving embrace, he will do anything and everything to get us to surrender to the ultimate lie that we are merely God’s misfit toys, not meant or fit to aspire to holiness, much less sanctity. Since God’s open arms in the face of our defects make no sense to us, sin becomes our unique opportunity and strategy to sabotage ourselves. If God is all love, then it follows that sin becomes the singular and collective expression of self-hate, the self-fulfilling prophecy of a doomed eternity in despair that we deserve as fallen followers of a fallen leader. If the gap between God’s goodness and our defect is so great, so seemingly insurmountable, then the direct, simplistic response to that perceived gap is to surrender, to stop wasting our time trying to be something we can never be. Why try to be more like Jesus, when we are a lot more like the devil? This is hell’s propaganda for perdition, but we do not have to buy that propaganda. Therein is the ultimate twist of Divine Mercy. Namely, that we are not called or expected to grasp for a perfection of which we are innately incapable as defective human beings. Such a misguided effort will merely lead to frustration, defeat, desperation, and surrender, not to mention the inherent self-obsession of those wrapped up in their ups and downs. Rather, Divine Mercy lovingly and patiently asks us to admit our limitations, seek forgiveness and forgive in return, and love God so much that we dare to offer our defective selves in His service despite the fact that our self-appraisal of our own value, worth, qualification, and merit for that service is so apparently pathetic. At the end of the day, following Christ is not about happily skipping on some cloud without faltering or falling. If we have learned anything from this world, it is that following Our Lord is more about getting up from the falls and stumbles than pretending that we can always avoid them. Christ never promised us that we would never fall while following Him, but that He would always be there to help us get up again. 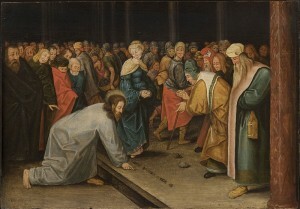 In fact, did not Christ Himself fall on the way to Calvary? It is curiously ironic, I think, that the word “sin” in Spanish means “without”, for sin is truly choosing to be “without” God. Let us recall that Peter loved and trusted Jesus despite his betrayal, and that the good thief humbly gained salvation at Calvary as well. Whether we swallow our hollow pride and reach for Christ as Peter did, or follow Judas by wrapping that pride around our necks, is our eternal decision to make. In this beautiful year of Divine Mercy, let us resolve to love God with enough trust, obedience, and dedication to overcome the self-sabotage of sin. Last week, one of my fifth-graders asked what the seven deadly sins were. Always one to tap into their googling abilities, I tossed the question back at them, promising a candy prize for anyone who came back to class this week with the right answer. The boy who posed the question came in, not only with the answer, but with a list he had typed himself with the punishments in hell included. His mom told me, with a strange smile on her face, that he had been obsessing about it all week. Two other students had also looked up the answers and one of them was prepared to explain them. It was obvious these kids had spent some time on this. Our discussion was intense, colorful, and, I hope, Spirit-filled. Most of the sins were things that the kids weren’t sure about: how is pride both good and a deadly sin? What is lust? And gluttony means being fat, right? Our topic for the night was “Living as Children of God,” and I had planned to talk about both 1 John 3:1-10 and the Beatitudes, with a discussion of God’s love and how we can be protected from sin. Of course, I didn’t know that when I challenged them to let me know what the seven deadly sins were. Next week, I’ve challenged my students to bring in the corresponding virtues for each of the seven deadly sins. Looking over the list, I have to admit that there’s something about this whole topic that speaks to me. So often, I think my sins are tiny little things. Then I look at the confession habits of those holy moderns, Blessed John Paul II and Blessed Mother Teresa, and I realize that my sins are anything but inconsequential. Looking over the seven deadly sins and the corresponding virtues and then discussing it in an up-front, honest, down-to-earth way with a room full of fifth graders is almost an examination of my own conscience. Considering how often I flirt with these Big Seven Sins is humbling, to say the least, and also a reminder to me of how very much I need the sacraments, especially of Reconciliation. 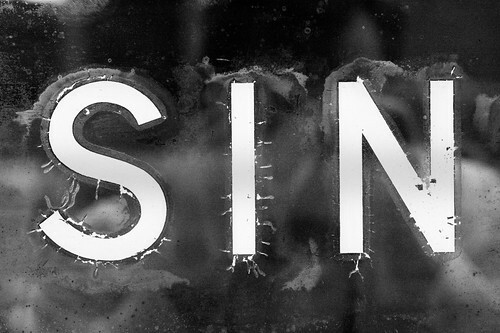 YOUR TURN: Have you covered the seven deadly sins with your students? How did it go? Have any tips to share?